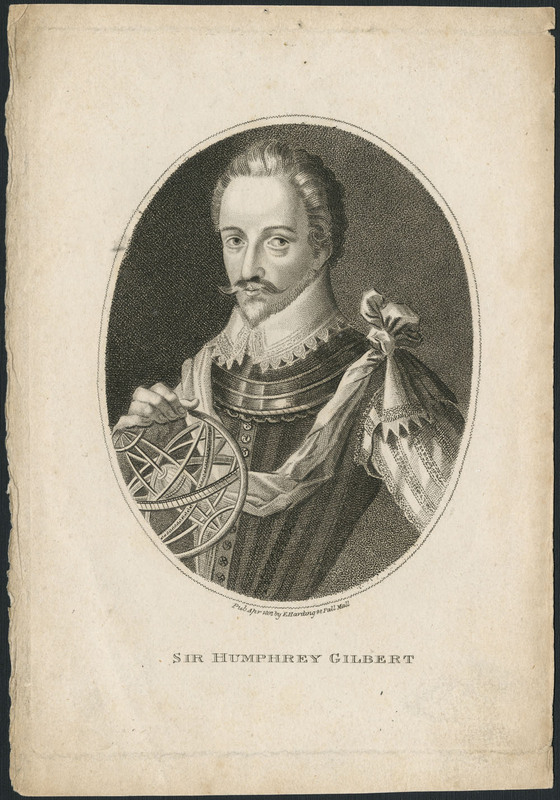 GILBERT (Gylberte, Jilbert), SIR HUMPHREY, Elizabethan explorer who annexed Newfoundland to England, second son of Otho and Katherine Gilbert of Compton and Greenway, Devonshire, half-brother (through his mother) of Sir Walter Raleigh and Sir Carew Raleigh; b. c. 1537; d. 1583. Gilbert is said to have been to Eton and to Oxford University and in 1558 was living in one of the Inns of Court (New Inn) in London. He had then been for some time in the service of Princess Elizabeth; after her accession to the throne she continued to remember him. In 1562–63 he served with an English force at Havre-de-Grâce (Le Havre) and is thought there to have met Frenchmen who had been across the Atlantic and who first interested him in America. On his return he began to study academic geography in order to see whether or not there was a water passage by the northwest of America to Asia. He petitioned the queen late in 1565 to allow him and his brothers to try to find such a passage. With Anthony Jenkinson, he debated the rival claims of northwest and northeast passages before Queen Elizabeth and the men finally agreed to co-operate, although they never did so. By 30 June 1566 Gilbert had completed a treatise, the title of which, when later revised, was “A discourse of a discoverie for a new passage to Cataia,” to prove the existence of a northwest passage. His geography, if learned and often ingenious, was mostly preposterous. However, he put forward proposals not only for trading with Asia, but also for utilizing North America on his way. He thought a colony and half-way station should be set up “about the Sierra Nevada,” in northwest America, and he considered trade with North American Indians might be a good and profitable thing in itself. Gilbert served as an officer in Ireland for three and a half years, being an M.P. in the Irish Parliament of 1569–70, and on 1 Jan. 1570 was knighted for his services by Sir Henry Sidney, the lord deputy. Gilbert was deeply involved with Sidney in planning a large-scale settlement of Ulster by Devonshire gentlemen and their dependents and in making colonizing proposals for Munster. Although Ulster and Munster were not in fact planted at this time, the idea of exploiting unlimited land remained with Gilbert and reappeared later in his American plans. He returned to England in 1570 and married Anne Aucher, an heiress of a Kent county family, by whom he was to have no less than six sons and a daughter. He was elected M.P., with John Hawkins, for Plymouth in the Parliament of 1571. He received rewards from the Crown in the shape of leases and licences and associated himself from late in 1571 with an alchemical project, in which Sir Thomas Smith, the secretary of state, was deeply concerned, for transmuting iron into copper and antimony and lead into mercury. With more significance, he led the first English force, a thousand men, to the assistance of the Dutch sea-beggars in their attack on Spanish power in the Netherlands. Based on Flushing from July to November 1572, he occupied substantial Spanish forces without, himself, showing outstanding military qualities. For some years, he was given little to do by the queen and settled down to study and make plans for reforming the government of Ireland and for setting up, in England, a new “modern” type of institution of higher learning where modem languages, science, and applied mathematics would be taught. He also took out and refurbished his “Discourse” on the northwest passage. Michael Lok and Martin Frobisher consulted him about their plans from 1574 onwards to establish a company to exploit the supposed passage. Gilbert gave advice and his name as a subscriber, but nothing more, except that his “Discourse” was at last published in 1576, possibly without his consent. From 1576 onwards Gilbert is regarded as an authority on America and he does his best to become one. He turned in 1577 to the making of extreme anti-Spanish plans-to seize a major island in the West Indies, to capture the foreign fishing vessels at Newfoundland (his first known association with the island), and to convert them into a privateering fleet-for which he failed to get support at court. He then produced a more concrete scheme, which led the queen to grant him letters patent on 11 June 1578 to discover and occupy in the next six years a site for a colony not already in European hands. It is clear from the fact that he was authorized to expel any intruders who planted within 600 miles of him, that the coast of eastern North America was his objective. He himself could hold land there and convey it to others, but all would in turn be held from the Crown, while his colony was to be governed by laws agreeable to those of England. Gilbert now prepared to take advantage of his newly granted rights by planning an ambitious expedition across the Atlantic. He received advice from the learned Dr. John Dee, who was mainly interested in finding routes to Asia, and from the elder Hakluyt, who made sensible suggestions for settling Englishmen in lands between 35° and 40°N. We know, too, that he was in close touch with Sir Francis Walsingham, the secretary of state. 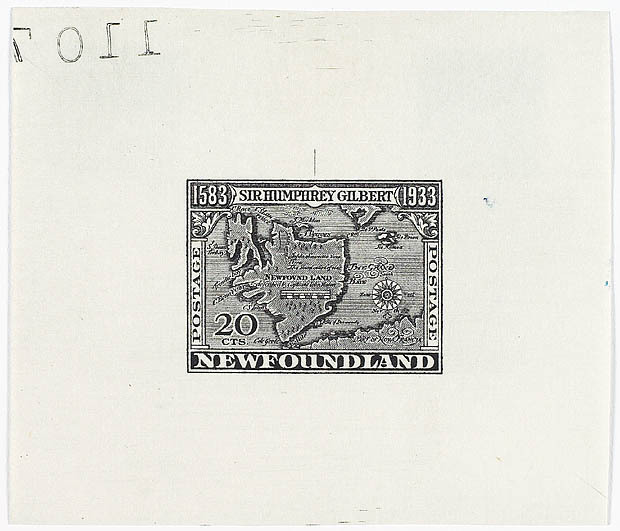 It is also probable that he heard about the possibilities of settlement in Newfoundland from Anthony Parkhurst. There is little doubt that Gilbert expected to rob and plunder any Spanish ships he encountered, and that he favoured working round by the Caribbean and up the North American coast, but we cannot say where he had finally decided to settle. By mid-November Gilbert had assembled a fairly powerful squadron at Plymouth, consisting in all of ten vessels, heavily armed and manned (175 guns, 570 men). Many of the men were pirates and some had been reprieved from execution to go with Gilbert. Not surprisingly, some of them refused to obey Gilbert’s orders: Henry Knollys took off three ships for a purely piratical cruise (one or more of the remaining ships joining him later). Gilbert’s remaining seven vessels left Plymouth on 18 November, but soon had to put into Cork harbour, since the Falcon and perhaps Gilbert’s own flagship, the Anne Ager (or Anne Aucher), were leaking, while another had to return to England for the same cause. Stores also were apparently quite inadequate. The result was that, although Gilbert set off into the Atlantic again about February 1579, he had to return to Dartmouth by the end of April. The Falcon alone, with Walter Raleigh in command and the Portuguese Simon Fernandez – a captured Caribbean pilot reprieved by Walsingham and given to Gilbert – as pilot, reached the Canary Islands and made out to sea for the West Indies and the eastern coast of North America under Fernandez’ guidance. She failed, however, to get there and had to return to Plymouth in May. The failure of the expedition was complete. It revealed grave defects in its leader’s organizing capacity and involved the loss of the greater part of Gilbert’s personal fortune, and part of his family’s. 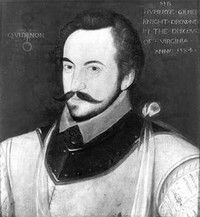 Gilbert was now glad to take temporary service with the Crown and to serve with three ships off the Irish coast from July to October 1579, but he soon reverted to his American plans. The mishaps to his 1578 venture had the negative effect of turning him away from southeastern North America to New England and Newfoundland. He equipped his tiny 8-ton frigate, the Squirrel, for an American reconnaissance, and she sailed under the command of Simon Fernandez, with a crew of ten, to North America and back within three months-a fine achievement. We have no specific evidence where she made her landfall, but her reports of the country were clearly encouraging. By this time Dr. John Dee had convinced Gilbert that his most desirable objective would be the River of Norumbega, or “Refugio,” of Verrazzano (Narrangansett Bay, R.I.), while he himself acquired Gilbert’s rights to all land north of 50°, including northern Newfoundland, most of the St. Lawrence valley, Labrador, and the northwest passage as shown on his map of 1580. This would indicate that Gilbert’s objective lay to the south. We know little of Gilbert’s activities during the latter part of 1580 and early in 1581, except that he was an active M.P. (for Queenborough, Kent) between January and March 1581, and that his final preparations for an American venture began in the summer of that year. Gilbert’s main proposition to potential supporters was that there were vast quantities of land, fertile and in good climates, waiting to be occupied by Englishmen, and that he would, for a consideration, give them title to great estates there. This appealed especially to loyal English Roman Catholic gentlemen, who were now subject to crippling fines as recusants as long as they refused to conform to the Church of England, but who did not want to go into exile amongst her enemies on the continent. Sir George Peckham of Denham, Bucks., and Sir Thomas Gerrard of Bryn, Lancs., emerged as the leaders of this group and did their best to assemble their co-religionists behind Gilbert. Between June 1582 and February 1583 Gilbert assigned no less than 8,500,000 acres of land in America to them, the area to be around the River of Norumbega and the bay of the five islands lying nearby, the Roman Catholics undertaking to make their own way to America. Gilbert himself concentrated on mobilizing the townsmen and gentry of the south and southwest of England – the town of Southampton was awarded a monopoly of trade from the colony – promising some of them land and others trading rights. The main settlements would be knit into a single proprietory polity under his personal government, while a commercial corporation was to be founded to control trade and provide the mechanism for continuing the flow of settlers after Gilbert had departed for America. However, the Catholic group was badly weakened during 1582 by attempts of their clergy and by Spanish agents to dissuade settlers on the grounds of religious disloyalty or danger. Consequently, no expedition under Catholic auspices sailed early in 1583, as had been originally planned. Moreover, Christopher Carleill, stepson of Sir Francis Walsingham, on whose goodwill Gilbert relied for official tolerance of his project, was also in the field with a semi-independent project. Depending on the Bristol merchants, and trying to get support from the Muscovy Company as well, his plan, ostensibly, was to settle 100 men at 40°N or thereabouts, as a base for fishery, lumbering, and trade with the Indians. Carleill, however, proved willing to let Gilbert get away first. In the meantime a great deal of news-gathering about North America had been done. 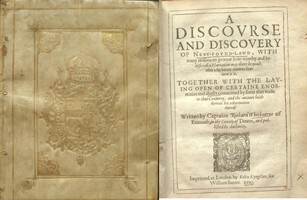 The younger Richard Hakluyt was commissioned to put together all he could gather from printed or manuscript sources and brought out his Divers voyages touching the discoverie of America in May 1582 (republished Hakluyt Soc., Ist ser., VII, 1850), with documents ranging from John Cabot’s patent in 1496 to Verrazzano’s account of his 1524 voyage and Ribault’s narrative of the 1562 Florida colony, as well as lists of American commodities and advice on colonization. David Ingram, Simon Fernandez, and a certain John Walker, who had made a voyage in 1580 to an inlet, which was either the Penobscot or the Bay of Fundy, were interviewed in August and September by Walsingham, Peckham, and others. During 1583 Ingram’s travels were published, as were Carleill’s proposals and also a poem on Gilbert’s voyage by Stephanus Parmenius. North America was therefore much in evidence. Gilbert knew the elaborate map of North America, which John Dee made for Queen Elizabeth in 1580 and which assembled all the knowledge at that time available to Englishmen, while he also acquired a circumpolar map, which Dee made specially for him in 1582–83. Both had some influence on his geographical conceptions. Dee believed particularly in the existence of a passage through North America in temperate latitudes by way of the St. Lawrence or the River of Norumbega. (See: Ganong, “Crucial maps, ix.” The Gilbert map is now in the Elkins Collection, Philadelphia Public Library.) He was also supplied with an elaborate set of instructions to enable mapping of the coast to be developed and a survey made of natural resources, including flora and fauna, and of Indian peoples (with pictures) to be in the charge of a man, Thomas Bavin otherwise unknown. Professor E. G. R. Taylor (Mariner’s Mirror, XXXVII, 48) considered that William. Borough. clerk of the Navy Board, was partly responsible for their drafting, while the two Hakluyts, the lawyer and his younger clergyman cousin, are also likely to have been concerned (see: Roanoke voyages (Quinn), I, 49–54). The discovery of the instructions suggests that Gilbert’s planning was on a more advanced scientific level than had hitherto been thought likely, though the scale of the projected survey was probably quite out of proportion to the resources at his disposal. Gilbert had to choose from a number of alternatives in planning his voyage. His final decision was to follow the well-known track of the Newfoundland fishing fleet to the Banks and then, making for Cape Breton, to follow the mainland coast southwards until he found an attractive site for a colony or reached Dee’s Verrazzanean harbour. He expected to get away early in the spring of 1583, but the queen urged him, as “a man noted of not good happ by sea,” to stay behind. On 16 March she relented however and sent him a token of her goodwill (“an ancor guyded by a Lady”), but he was not ready until June. He had then five vessels at Plymouth – the Delight, 120 tons, owned by William. Winter, her captain, and Gilbert’s elder brother Sir John; the flagship, on which he was to sail as “General” of the expedition; the Bark Raleigh. 200 tons, owned and commanded by his rising young half brother Walter Raleigh; the Golden Hind, 40 tons, owned and commanded by Edward Hayes, whose account is the chief authority for the voyage; the Swallow, 40 tons, commanded by Maurice Browne (to which Gilbert had only a dubious title), on which the Hungarian Stephanus Parmenius sailed; and the Squirrel, 8 or 10 tons, now under William Andrewes, Gilbert’s little frigate which had made the 1580 voyage. They set out on 11 June. Bad luck again afflicted Gilbert, since the Bark Raleigh turned back shortly after sailing, but the remaining vessels kept company on a slow voyage until 23 July when the ships were not far from Newfoundland, though well to the north of the fishery. They then separated in fog and the Golden Hind had to work down from what Capt. 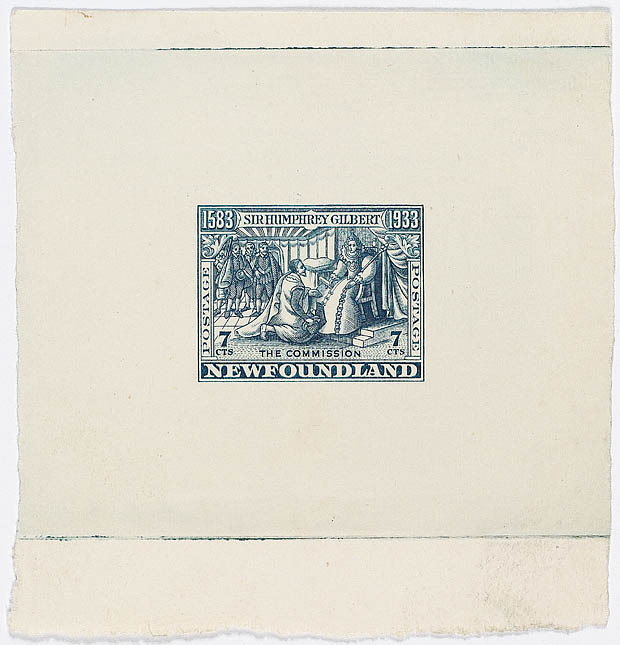 Hayes reckoned was 51°N to Conception Bay, where she picked up the Swallow, and then to St. John’s, where she found the Squirrel outside the harbour, and, on 3 August, the Delight. Although the port admiral was an Englishman, he had mobilized the crews of the 36 ships, Portuguese, Basque, and French as well as English, to deny passage to Gilbert. The reason for this was the piracy by the Delight’s master, Richard Clarke, against Portuguese ships in the harbour in 1582, which the fishermen were determined to stop. Gilbert flourished his royal commission (evidently his patent) and the English fishermen gave way, so that his little squadron entered the same day. 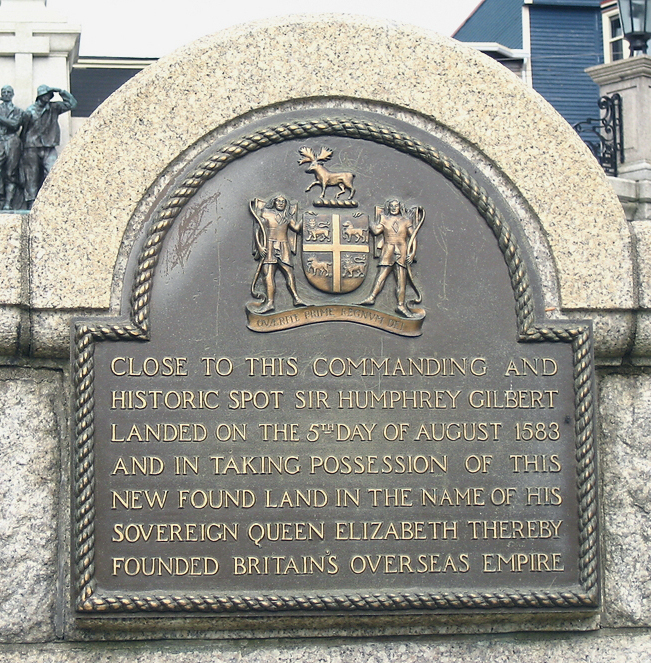 Gilbert had already fully formed the plan of taking possession of Newfoundland for the English Crown. This was not Precisely forecast in any earlier pronouncements, though it was envisaged as a possibility by Anthony Parkhurst in 1578. To make such sovereignty effective he would need an armed shore establishment, which could issue licences to fishermen and assign shore stations. What Gilbert did was to issue to each of the 36 vessels in the harbour a certificate authorizing it to continue fishing (a version of one of these has recently been found in Seville, Archivo de Indias, Patronato 265, ramo 40), while, in return, he levied a contribution in kind from the fisheries for the supply of his own ships, poorly provisioned to begin with and worse off for having been over seven weeks at sea instead of the normal three or four. 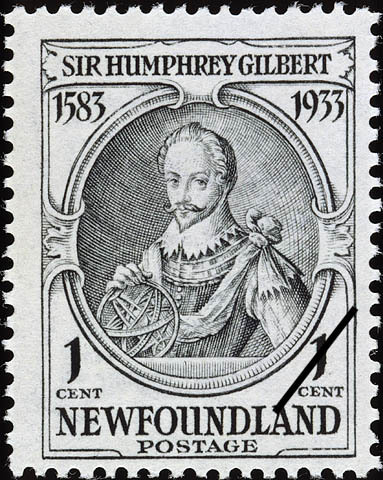 On 5 August Sir Humphrey Gilbert formally took possession of Newfoundland and of the land 200 leagues to the north and south (i.e., from approximately 37°35’N to 57°35’N). The merchants and fishermen assembled before his tent, a rod and turf were cut and delivered to him in virtue of his personal title to the soil, and he proclaimed the land to be the queen’s in perpetuity. He promulgated “laws” to be observed – no public exercise of religion apart from that of the Church of England, no opposition (on pain of punishment for high treason), no disrespect to the queen (without cutting of ears and seizing of ships and goods). To all these his audience assented, being unable to do otherwise, and, no doubt, glad to get off so lightly. 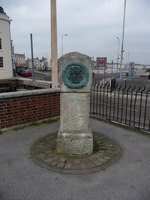 A formal marker was set up at St John’s – a wooden pillar with the royal arms in lead attached. Further, he assigned drying stages in perpetuity to certain fishermen (previously the first corners had obtained them). All this presupposed continuous occupation and was almost meaningless without it. On 4 August Gilbert had gone ashore to look at a wild garden with roses and raspberries, which had some young English peas growing in it. After the 5 th he went out with the parties which tried to enter the almost impassable forest and examined the shore and inland hills for signs of minerals. His Saxon mineral expert, Daniel, collected iron ore and what he said was silver. Gilbert made a great show of secrecy about the latter. Hayes and Parmenius made some observations of the land and of its potentialities. His men were in bad shape – some were determined to go no farther so the Swallow was sent back with the sick and recalcitrant (including the captains of the Delight and Squirrel). 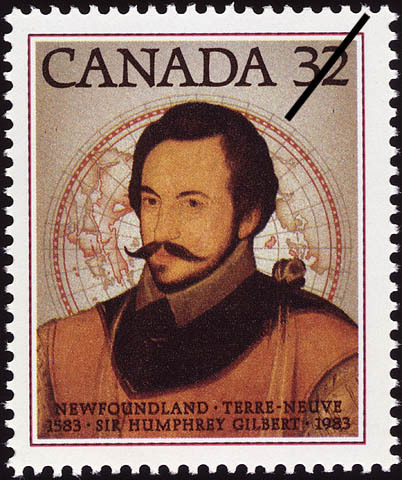 Hayes tells us that Gilbert was so attracted to Newfoundland and its minerals that he was determined to return there, but that his obligations to his friends – Peckham and those who hoped to settle farther south – bound him to continue his voyage down the mainland coast, so as to take formal possession of the land there before his patent expired in June 1584. Leaving with his three remaining ships on 20 August, Gilbert worked down to Cape Race, off which they did some cod-fishing, and then sent shore parties to sample the soil on Trepassey and Placentia bays before sailing for Sable Island on 22 August. They had had a course worked out for them by a Portuguese fisherman at St. John’s who recommended them to visit the island to obtain some wild cattle and pigs loose there (released he said by the Portuguese some 30 years before). The voyage was slow but uneventful until the 28th. Then Gilbert, sailing in the Squirrel, quarrelled with Richard Clarke about his course, and made him change from westsouthwest to northwest; William Cox, master of the Golden Hind, disapproved of the change. After a windy night, the ships found themselves in shoal water on the morning of the 29th, and the Delight’s crew, keeping a poor look-out, were unable to prevent her going aground and rapidly breaking up. Richard Clarke rescued 15 men in the ship’s boat, but the rest-Parmenius, Saxon miner, ore, and all-were lost. The Golden Hind and the Squirrel “cast about Eastsoutheast, bearing to the South, even for our lives into the windes eye,” as Hayes tells us, and so escaped. Although George Patterson argued that the traverses given by Hayes would have brought them to Gabarus Bay, not Sable Island, this is not established as the courses are open to several interpretations. It appears probable, however, that if the men were correct in their calculations, they had in fact passed to the north of Sable Island and were caught on the shoal (the West Bar) which stretches out to the west behind the island. The loss demoralized both the remaining crews: they were now quite sure that their poor equipment and stores would be insufficient. Consequently, and after much discussion with Hayes and Cox, Gilbert decided on 31 August to return. The wind was now in their favour and they sped back to Cape Race in two days and were soon clear of land. Gilbert had hurt his foot on the Squirrel and, on 2 September, came on board the Golden Hind to have it dressed and to concert means of keeping the two little ships in company with each other. He refused to leave the Squirrel, and the vessels set out on the Atlantic crossing. After a sharp storm, they had a spell of good weather and made fair progress: Gilbert came aboard the Golden Hind again, talked and made merry with Hayes, and insisted once more on returning to the frigate, even though Hayes maintained she was over-gunned and unsafe for sailing. Some 900 miles on from Cape Race they encountered very heavy seas, “breaking short and high Pyramid wise,” said Hayes. On 9 September the Squirrel was nearly overwhelmed but recovered, and in a calmer spell Gilbert hailed the Golden Hind. He was sitting towards the stern with a book in his hand, repeatedly calling out “We are as neare to Heaven by sea as by land.” It is thought that the book was More’s Utopia and the passage which had struck his imagination in these desperate circumstances was: “He that hathe no grave is covered with the skye: and, the way to heaven out of all places is of like length and distaunce.” It was to be Gilbert’s last-and famous-recorded saying. At midnight the frigate’s lights went out; the watch cried “the Generall was cast away,” and at that moment, in Hayes’ words, “the Frigat was devoured and swallowed up of the Sea.” The Golden Hind continued on her course and reached Falmouth on the 22nd, sailing on to bring the tragic news to Sir John Gilbert at Dartmouth. On board ship on the way home, Hayes had found Gilbert “wholly fixed on the New found land.” He was determined to return there in 1584 while Hayes and Cox would take over the southward exploration of the mainland coast. He was also optimistic about his chances of getting two squadrons to sea, since he believed the queen would lend him £10,000. 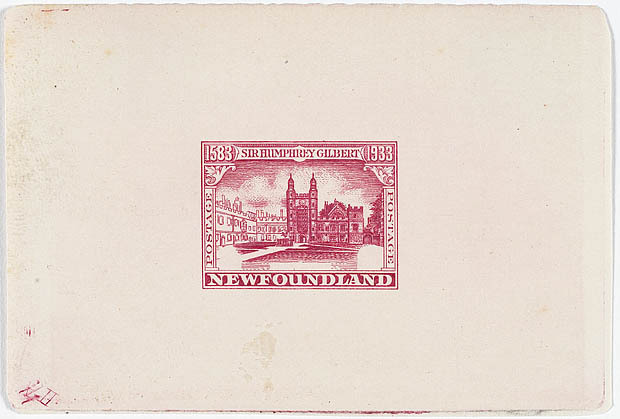 The basis for this belief seems to have been his confidence that he could assure her, in spite of the loss of the ore samples on the Delight, that there was silver to be mined in Newfoundland. Or else, perhaps, he was letting his obsessive fancy take hold of him. Sir Humphrey Gilbert’s personality is difficult to assess. He was an able soldier, but evidently more an ingenious tactician than an organizer or strategist. He had some appreciable intellectual ability. He was physically brave and had considerable determination. Clearly, he spoke with authority to his men on land or sea. 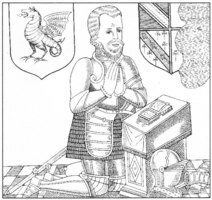 But he was cruel – Thomas Churchyard tells us that when he received submissions of some Irish lords in his tent, a border leading to it was lined with the heads of their associates. He was liable to break out into violent rages when he would inflict physical violence on his dependents. He was intermittently homosexual (Sir Thomas Smith said that the only way to soothe his temper was to send a boy to him). He was vain and, one suspects, sometimes pompous. His American plans and dreams became something of an obsession. His vision of a transplanted English gentry exploiting vast new American lands in a feudal setting was not wholly unrealistic (it was to be realized later, to some extent, in Maryland) but his plans were far too wide-ranging for his resources and there was some lack of scruple in his easy disposal in bulk of lands which he had never seen. He did not realize the slow, painful, and expensive character of colonization in temperate climates. His impatience is also shown in his dealings with Newfoundland. Control of the fishery had superficial attractions, but it would need an expensive shore establishment (and settlers proved hard to keep on Newfoundland in the 17th century) and even then, since the French and other foreigners might well keep away from the English-dominated areas or even arm posts of their own, it would not necessarily pay its way. 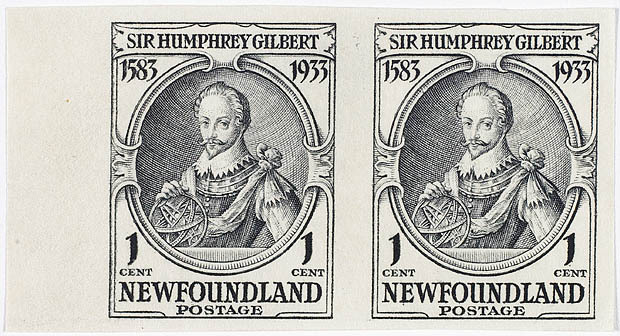 Gilbert seems to have been far too optimistic, on too little evidence, about the value of Newfoundland minerals. His ventures, however, focussed attention sharply on the possibilities of North American colonization and helped greatly to make it a continuing English objective. Walter Raleigh had Sir Humphrey Gilbert’s patent reissued him in his favour early in 1584, with Newfoundland excluded from its scope, and sent a series of colonies to Roanoke Island in North Carolina. 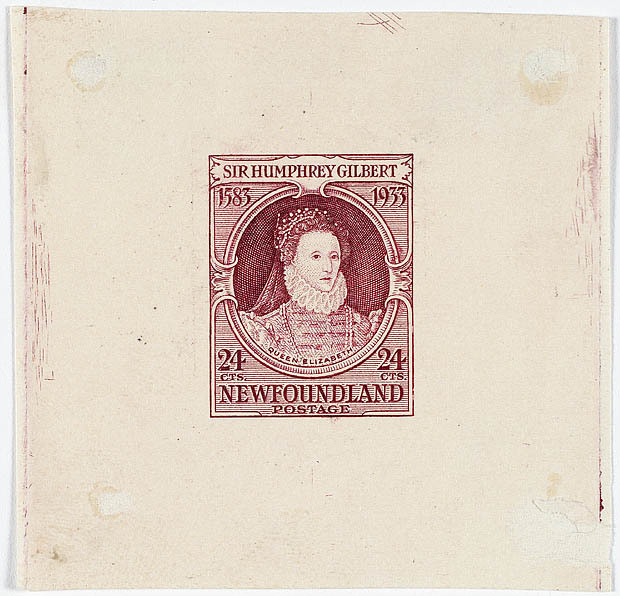 Newfoundland, in theory, should have been governed according to elaborate arrangements made with Peckham and Sir John Gilbert, but though Sir John sent ships there in 1584 he evidently found any control of fishery and fishermen impracticable and did not renew the attempt (we lack any narrative of events there in 1584). Sir George Peckham was still in the field, even if most of his Roman Catholic supporters had deserted him. He made the best he could of the Newfoundland events and of the prospects of mainland estates in his A true report which he finished on 12 Nov. 1583, and which was published soon after. But, although he was trying to collect subscribers early in 1584, he was making so little headway that the authorities sent him back to prison as a recusant and he passes out of the colonizing story. Christopher Carleill, undoubtedly influenced by Gilbert, continued the latter’s preparatory work. His objective was land to the southwest of Cape Breton and perhaps the St. Lawrence. 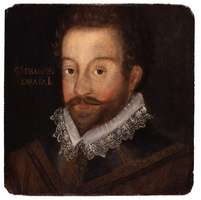 He had reports of French activity there and received further news in the spring of 1584 through the younger Richard Hakluyt, now attached to the Paris embassy. Carleill sailed as far as Ireland early in the summer, but, for a reason so far unknown (perhaps the discovery that his supplies were inadequate), he turned over his three ships for government service in Irish waters at the beginning of August and, himself, settled down in military employment in Ireland for some nine years (with an interval in 1585–86 when he served on Sir Francis Drake’s West Indian voyage and may well have entered Newfoundland waters on his way homeward). Later he returned to his plan made with Edward Hayes, which was a fresh scheme for settling in the region of the Atlantic Provinces and the Gulf of St. Lawrence in 1593–94 [see Hayes]. Dr John Dee had planned to follow up his grant of 1580 from Gilbert by getting a patent to prospect for northerly passages, but he was diverted by an invitation to go to Poland, which he accepted in September 1583. He relinquished his projects (and apparently his grant) to Adrian Gilbert, Sir Humphrey’s younger brother, who was duly given a patent for the discovery of a northerly passage in February 1584. From this sprang the masterly explorations of John Davis, 1585–87. From Gilbert, then, derived the attempts to settle the Roanoke Island colonies and also the most fruitful northwestern voyages of the 16th century. He also, by annexing Newfoundland, (though this remained a formality until 1610), gave Englishmen a continuing interest in what went on in the fishing industry and provoked subsequent plans by Hayes and others to control the fishery, leading in the end to the Jacobean colonies. He attracted attention to New England and the region of the Atlantic Provinces as possible sites for English settlements, and, by his elaboration of the concept of proprietorial colonization, influenced later events in Newfoundland, Nova Scotia, Maine, and Maryland. BM, Add. MS 38823, ff.1–8 (see E. G. R. Taylor, “Instructions to a colonial surveyor in 1582,” Mariner’s Mirror, XXXVII (1951), 48–63). BM, Lansdowne MS 144, f.384, Dr. Thomas Wilson to Captain Augustine Clarke, 10 April 1580. PRO, H.C.A. 13/23, 14 Nov. 1578, Thomas Gager, 20 May 1579, John Webster, 26 May 1579; S.P. 12/42, no.23.. ... Sir Humphrey Gilbert, A discourse of a discoverie for a new passage to Cataia (London, 1576); repr. in Voyages of Gilbert (Quinn), I, 129E. Voyages of Gilbert (Quinn) include almost all the Gilbert documents and a biography. Edward Hayes, “A report of the voyage and successe thereof, attempted in the yeere of our Lord, 1583. by sir Humfrey Gilbert knight . . .” in Hakluyt, Principall navigations (London, 1589), 679–97; repr. in 2nd ed. Hakluyt, III (1600), 143–61; Hakluyt Soc. ed. (1903–5), VIII, 34–77. Index to administrations in the Prerogative Court of Canterbury, ed. C. H. Rudge (British Record Soc., LXXVI, 1954), 65, contains probate of will of Gilbert, Oct. 1584. Peckham, A true report. Queen Elizabethes Achademy, ed. F. J. Furnivall (Early English Text Soc., extra ser., VIII, 1869), 1–12. [“The erection of an Achademy in London for educacion of her Majestes Wardes, and others the youth of nobility and gentlemen [by Humphrey Gilbert?].] Sir Humfrey Gylberte and his enterprize of colonization in America, ed. Carlos Slafter (Prince Soc., XXIX, Boston, 1903). ... Ganong, “Crucial maps, IX.” W. G. Gosling, The life of Sir Humphrey Gilbert (London, 1911). G. B. Parks, “George Peele and his friends as “ghost’ poets,” J. English and Germanic Philology, XLI (1942), 527–36. D. B. Quinn, “Simão Fernandes,” Congresso internacional de historia dos descobrimentos Actas, III (1961), 449–65. Roanoke voyages (Quinn), I, 49–54. Joan Wake, The Brudenells of Deene (London, 1953). Portraits: painting by anonymous artist (perhaps painted after his death), in Compton Castle, Devonshire; engraving by Robert Boissard (from lost portrait) in Bazilιωlogia (1618), re-engraved for Henry Holland, Herωologia anglica (1620) (see: Engraving in England in the sixteenth and seventeenth centuries: a descriptive catalogue, intro. by A. M. Hind (2v., Cambridge, 1952–55), I, xxiv, 187–92). David B. Quinn, “GILBERT, SIR HUMPHREY,” in Dictionary of Canadian Biography, vol. 1, University of Toronto/Université Laval, 2003–, accessed April 24, 2019, http://www.biographi.ca/en/bio/gilbert_humphrey_1E.html.